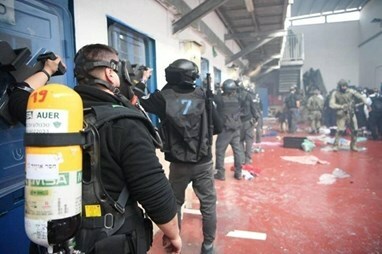 Occupied Palestine, ALRAY - Dozens of Palestinian detainees sustained Sunday evening injuries during violent clashes with Israeli soldiers in Negev prison, two of them in critical condition, Head of Detainees affairs commission, Kadri Abu Bakr reported. Abu Baker added that Israeli prison services reported lift seven of the detainees to Soroka military hospital in Beersheba, to receive treatment after being beat in the Negev prison, their health status is unknown. He noted that two of the injuries are in critical conditions, they are identified as Islam Weshahee and Odai Salem. A group of lawyers of the commission are to head to Soroka hospital to follow up detainees conditions. The Special Forces of IPS, broke into several sections tonight in the prison of the Negev desert, and assaulted the detainees and fired live bullets and coated with rubber and tear gas. The commission explained that since yesterday morning, the IPS has been trying to blackmail and provoke the prisoners. It transferred the detainees of Section 3 to Section 4 under the pretext of carrying out searches, during which there was an altercation between the detainees and the two jailers who tried to assault the detainees. It explained that the quell forces beat the detainees and fired tear gas and livebullets towards them. The two jailers who were stabbed are lifted by helicopter, one of them in critical conditions. The two detainees who are convicted of carrying out the condition very serious, and the transfer of the two prisoners, who are accused by the administration to carry out the attack are lifted after being brutally beat.